I am not a professional in the kitchen. In fact I normally don’t even cook a lot. That is until a couple of months ago when I started working just part-time and had a little extra time to do some real meal planning. Since then AllRecipes.com has become my bff on Friday afternoons when I do my menu for the following week. I usually just look for recipes that have lots of reviews and good ratings. This is a pretty good indicator that it’s going to be a hit. Be a little leery though of a recipe that it seems every review made a change to it.. a little harder to judge the original recipe that way. Tonights dinner came from this treasure on the web. 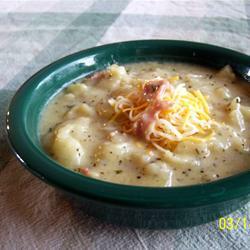 A baked potato soup. The picture is not the soup I prepared – but looks pretty much the same. The reviews were good and the ingredient list was within my comfort zone. I followed the recipe pretty much to a tee (I have yet to acquire the skill of – “oh I just threw a little of this in instead of that and I added this or that because I love it..” yeah, that’s beyond my skill set right now). The only changes I made was I added the bacon to the soup instead of using it as a garnish and I didn’t use the parsley, simply because I’m not a huge fan of parsley and I’m too lazy to chop of fresh.. Oh and I followed a review and only used half of the dried basil. I also timed the recipe by four. I wanted plenty to freeze for future meals, and I am SOO glad I did this. The soup was fantastic! The hot sauce gave it a little kick but wasn’t overpowering. It was a really good consistency as well, not too thick and not super runny. We had some zucchini bread left from last week that we ate with it but it would have been really good in a bread bowl or with some french bread to dip. I will definitely be adding this recipe to my stash!